General Hospital Poll: Max Gail Is Killing The Alzheimers Story – Do You Think He Deserves An Emmy? General Hospital has always been at the forefront of issues that affect our population; Aids, Child abductions, Bipolar/mental health issues and now Alzheimer’s disease. General Hospital fans were skeptical at first when Max Gail was recast as Mike Corbin, General Hospital Sonny Corinthos’ (Maurice Benard) father, however, after only a few weeks, he has proven his worth. The question is, does Max Gail deserve an Emmy for his Alzheimer’s performance? 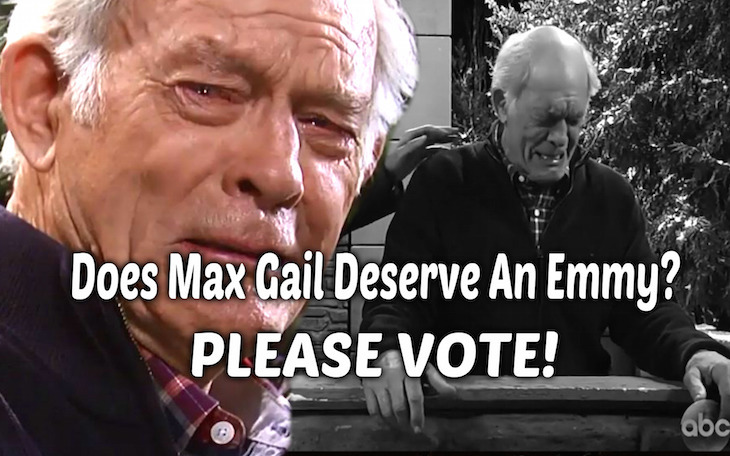 General Hospital fans have inundated social media with nothing but praise for Max Gail’s portrayal of a man suffering from the effects of Alzheimer’s. Maurice Benard performance deserves equal praise for his portrayal of a son torn by the pain of this disease. The two men have such great chemistry together it does not feel like they are acting. Max Gail has brought tears to the audience with his portrayal of a man dealing with a disease that will strip him of his memories and his ability to care for himself. Maurice Benard has been equally superb in his portrayal of a son who must accept the fact that he will watch his father slowly disappear right in front of his eyes. General Hospital fans remark they have not cried this much over any other storyline in General Hospital’s recent history. In fact, some fans say they never cry over soap operas, but this storyline has changed that. Each time Max Gail is on screen as Mike Corbin, he breaks our hearts a little more as we see him struggling to maintain his dignity and his independence. Max Gail and Maurice Benard’ performances are taking its viewers on a journey of the pain, frustration, anger and unspeakable loss felt by Alzheimer’s’ patients and family members who must live with each day. Alzheimer’s affects approximately 5.3 million Americans and tons of General Hospital fans have voiced their appreciation to the Powers that Be for bringing this important storyline into focus. We believe Max Gail deserves an Emmy. We would like to know what you think? Is his performance Emmy worthy? You decide and please vote in our Soap Opera Spy poll. As always, more detailed spoilers and a full collection of pictures for the week in question will appear here on Soap Opera Spy on Sunday, March 18, when there could be more clues and hints over exactly what’s going on.